Fall always means the beginning of pumpkin season!! For the month of October (and November for some) we get to indulge in all things pumpkin- lattes, cookies, cakes, muffins, pies, jack-o-lanterns, etc. 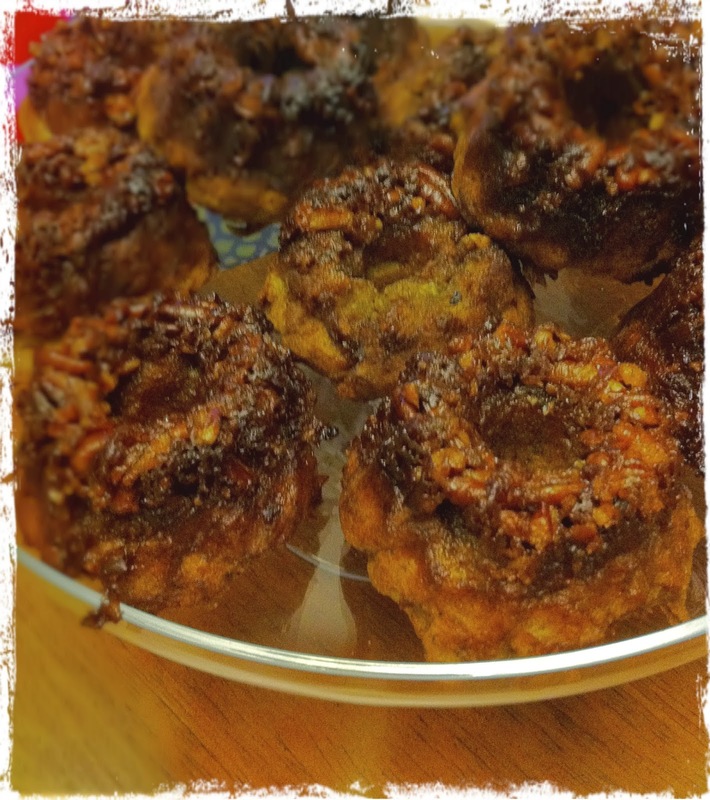 I found a great recipe for a pumpkin bread on Food.com while prepping for my mother in law's birthday and I adapted it into two other great recipes that can lend themselves to a mini bundt cake desert, as well as a breakfast or on the go muffin recipe. As I am not fond of overly sweet baked goods, neither of these recipes are too sweet, so feel free to enjoy one or two! My daughters also had a birthday party to attend and to fancy up the muffins to make them birthday party worthy, I decorated them with chocolate cream cheese frosting. I also found this great tip on Pinterest where you take a Mike and Ike's Candy and use half a tooth pick to make a whimsical cupcake topper. 1. Mix together butter, sugar, egg, canned pumpkin and vanilla extract. 2. In a separate bowl, combine flour, salt, cinnamon and pumpkin pie spice. 3. Pour wet ingredients into the dry and mix. 4. For bread, pour into a prepared loaf pan and bake at 350F for 50-60 minutes. 1. 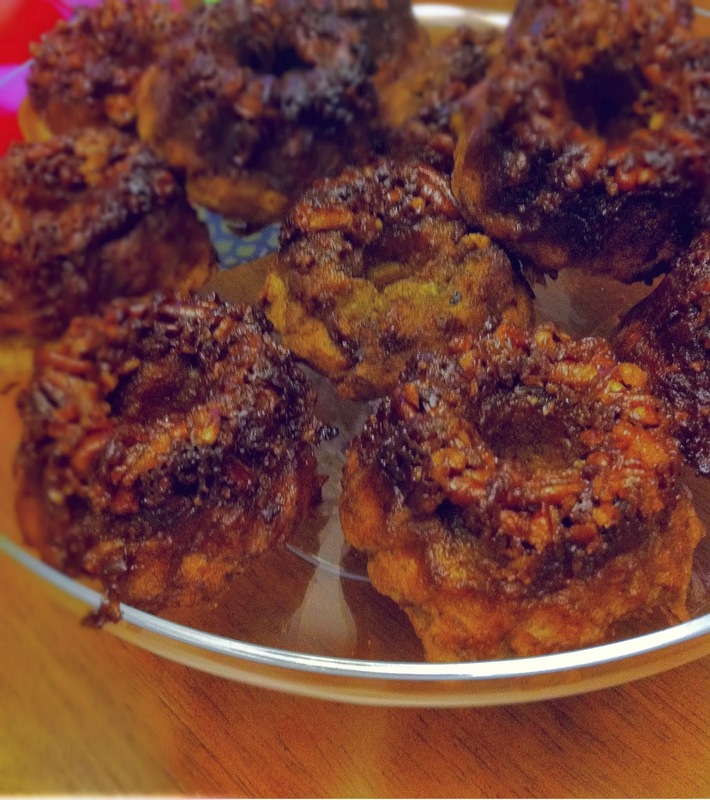 Grease mini bundt cake pan. 2. In a food processor combine the ingredients above until the pecans are small chopped size. 3. Put a bit of crumble topping into the bottom of each mini bundt cake pan. 4. Top with cake batter. 6. Let cool a bit before turning pan over and removing bundt cakes or topping will stay in the pan. - Delicious served with vanilla bean ice cream! 1. Grease muffin tin and pour batter into sections. 2. Bake at 350F for 25-30 mins. 1. Allow muffins to completely cool. 2. In a separate container, mix together cream cheese and icing sugar. Add to a piping container and decorate muffins. 3. Get creative with topper ideas- we used Mike and Ike candy and inserted 1/2 a toothpick into them to create a popsicle topper.